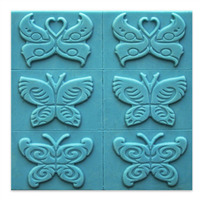 For centuries, the butterfly has been honored as a symbol of transformation. 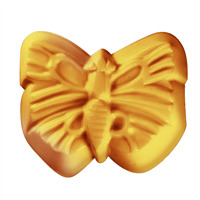 The Butterfly Soap Mold will help you unfurl your creative wings. COMMENTS: I love this mold. It's so pretty and just the perfect size. I will be buying more of these. COMMENTS: Beautiful mold! Nice detail and easy to remove soap after molding. COMMENTS: Produces beautiful soap especially if two toned. COMMENTS: I love the detail and the ability to create 3 different colors and 3 different scents at one time. It allows for more creativity for each mold, rather than needing to use the same scents and colors for each bar. I can't wait to try this with stained glass colors! 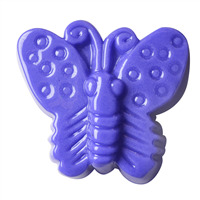 "Milky Way Butterfly soap mold"
COMMENTS: I am looking forward to using my new butterfly molds for soaps for my grandchildren who love butterflies. 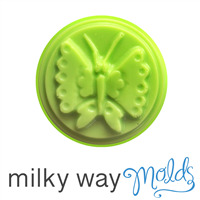 I have used the white Milky Way molds and loved them so I am looking forward to using the clear Milky Way molds. COMMENTS: We use this as kid bars and they simply love it ! COMMENTS: I originally got this for Easter but found so many people love be butterflies. Is a nice rounded corners shape and size. COMMENTS: Myself and my customers love this mold. I wish this was a 9 bar mold. COMMENTS: This mold is so pretty! Very easy to use and eye-catching! COMMENTS: This mold is smaller than expected, but it is also so much prettier than expected. The picture does not do it justice. COMMENTS: This is a very lovey mold, makes a good sized bar and is very detailed. COMMENTS: This really does make a very pretty bar of soap. The size is excellent, it feels comfortable in my hand. Only thing is you have to be careful and patient when releasing the bars from the mold since they do crack easily if you try to force it out.I use mineral oil in mold and freeze the soap before releasing. COMMENTS: we used this mold to create a very special and customized soap that we sold as a charity/fund raiser. The end product was exactly what we were looking for! COMMENTS: This mold is truly an eye catcher. Attention to detail makes this a customer's delight. Soap came out of the mold easily making this a very nice mold. I know I will get many uses from this mold. Would like moldings for four soaps in the casting mold, instead of three. COMMENTS: best to pour hot soap into these molds without worrying about melting the plastic I've found is to cut the molds into individual molds instead of leaving them as a whole immobile sheet. Pour about 1/4-1/2 inch of cold water into a pan, put molds in water, then pour hot soap into molds and refridgerate for about 3/4 hour. I usually put the pan of cold water and molds in the fridge before the batch is ready to cool the water even more. "Smaller bars than description states"
COMMENTS: This soap mold is excellent...makes my soaps look very attractive.. soap unmolds easily. Love this soap mold gonna order me another one soon! COMMENTS: This is a very detailed mold, gives room to get creative. The size is just right. My M&P soap came right out and it cleaned up good. Very pleased with this product!